Treat SAP HANA as a multi-dimensional source (default): In this case, the behavior will be similar to when Power BI connects to other multi-dimensional sources like SAP Business Warehouse, or Analysis Services. When connecting to SAP HANA using this setting, a single analytic or calculation view is selected and all the measures, hierarchies and attributes of that view will be available in the field list. As visuals are created, the aggregate data will always be retrieved from SAP HANA. This is the recommended approach, and is the default for new DirectQuery reports over SAP HANA. Treat SAP HANA as a relational source: In this case, Power BI treats SAP HANA as a relational source. This offers greater flexibility. Care must be taken with this approach to ensure that measures are aggregated as expected, and to avoid performance issues. The connection approach is determined by a global tool option, which is set by selecting File > Options and settings and then Options > DirectQuery, then selecting the option Treat SAP HANA as a relational source, as shown in the following image. The option to treat SAP HANA as a relational source controls the approach used for any new report using DirectQuery over SAP HANA. It has no effect on any existing SAP HANA connections in the current report, nor on connections in any other reports that are opened. So if the option is currently unchecked, then upon adding a new connection to SAP HANA using Get Data, that connection will be made treating SAP HANA as a multi-dimensional source. However, if a different report is opened that also connects to SAP HANA, then that report will continue to behave according to the option that was set at the time it was created, which means that any reports connecting to SAP HANA that were created prior to February 2018 will continue to treat SAP HANA as a relational source. The two approaches constitute different behavior, and it's not possible to switch an existing report from one approach to the other. Let's look at more detail about each of these two approaches, in turn. All new connections to SAP HANA use this connection method by default, treating SAP HANA as a multi-dimensional source. In order to treat a connection to SAP HANA as a relational source, you must select File > Options and settings > Options, then check the box under Direct Query > Treat SAP HANA as a relational source. While this feature is in Preview, reports created using the multi-dimensional approach cannot be published to the Power BI service, and doing so will result in errors when the report is opened within the Power BI service. In the Get Data Navigator, a single SAP HANA view can be selected. It is not possible to select individual measures or attributes. There is no query defined at the time of connecting, which is different from importing data or when using DirectQuery while treating SAP HANA as a relational source. This also means that it's not possible to directly use an SAP HANA SQL query when selecting this connection method. All the measures, hierarchies, and attributes of the selected view will be displayed in the field list. As a measure is used in a visual, SAP HANA will be queried to retrieve the measure value at the level of aggregation necessary for the visual. So when dealing with non-additive measures (counters, ratios, and so on) all aggregations are performed by SAP HANA, and no further aggregation is performed by Power BI. To ensure the correct aggregate values can always be obtained from SAP HANA, certain restrictions must be imposed. For example, it's not possible to add calculated columns, or to combine data from multiple SAP HANA views within the same report. Treating SAP HANA as a multi-dimensional source does not offer the greater flexibility provided by the alternative relational approach, but it is simpler, and ensures correct aggregate values when dealing with more complex SAP HANA measures, and generally results in higher performance. Any attribute that is included in at least one hierarchy will be hidden by default. However, they can be seen if required by selecting View hidden from the context menu on the field list. From the same context menu they can be made visible, if required. In SAP HANA, an attribute can be defined to use another attribute as its label. For example, Product (with values 1,2,3, and so on) could use ProductName (with values Bike, Shirt, Gloves, and so on) as its label. In this case, a single field Product will be shown in the field list, whose values will be the labels Bike, Shirt, Gloves, and so on, but which will be sorted by, and with uniqueness determined by, the key values 1,2,3. A hidden column Product.Key is also created, allowing access to the underlying key values if required. Any variables defined in the underlying SAP HANA view will be displayed at the time of connecting, and the necessary values can be entered. Those values can subsequently be changed by selecting Edit Queries from the ribbon, and then Manage Parameters from the drop-down menu displayed. The modeling operations allowed are more restrictive than in the general case when using DirectQuery, given the need to ensure that correct aggregate data can always be obtained from SAP HANA. However, it's still possible to make many additions and changes, including defining measures, renaming and hiding fields, and defining display formats. All such changes will be preserved on refresh, and any non-conflicting changes made to the SAP HANA view will be applied. No support for calculated columns: The ability to create calculated columns is disabled. This also means that Grouping and Clustering, which create calculated columns, are not available. Additional limitations for measures: There are additional limitations imposed on the DAX expressions that can be used in measures, to reflect the level of support offered by SAP HANA. No support for defining relationships: Only a single view can be queried within a report, and as such, there's no support for defining relationships. No Data View: The Data View normally displays the detail level data in the tables. Given the nature of OLAP sources such as SAP HANA, this view is not available over SAP HANA. Column and measure details are fixed: The list of columns and measures seen in the field list are fixed by the underlying source, and cannot be modified. For example, it's not possible to delete a column, nor change its datatype (it can, however, be renamed). Additional limitations in DAX: There are additional limitations on the DAX that can be used in measure definitions, to reflect limitations in the source. For example, it's not possible to use an aggregate function over a table. No aggregation of columns: It's not possible to change the aggregation for a column on a visual, and it is always Do Not Summarize. The results are as expected, when the SAP HANA view contains non-additive measures (for example, distinct counts, or averages, rather than simple sums). It's useful to start by clarifying the behavior of a relational source such as SQL Server, when the query defined in Get Data or Query Editor performs an aggregation. 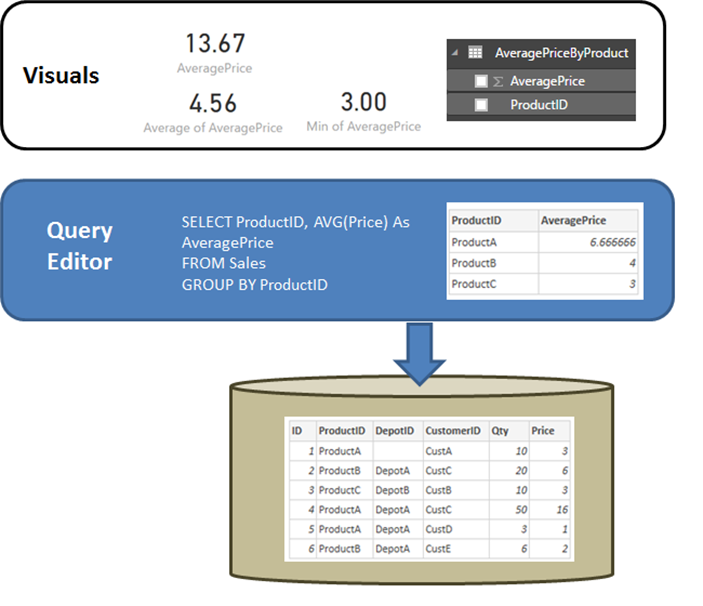 In the example that follows, a query defined in Query Editor returns the average price by ProductID. The data is imported at the level of aggregation defined by the query created in Query Editor. For example, average price by product. This results in a table with the two columns ProductID and AveragePrice that can be used in visuals. In a visual, any subsequent aggregation (such as Sum, Average, Min, others) is performed over that imported data. For example, including AveragePrice on a visual will use the Sum aggregate by default, and would return the sum over the AveragePrice for each ProductID – which in this example case would be 13.67. The same applies to any alternative aggregate function (such as Min, Average, so on) used on the visual. For example, Average of AveragePrice returns the average of 6.66, 4 and 3, which equates to 4.56, and not the average of Price on the six records in the underlying table, which is 5.17. Given the same query, logically exactly the same data is presented to the reporting layer – even though the data is not actually imported. In a visual, any subsequent aggregation (Sum, Average, Min, others) is again performed over that logical table from the query. And again, a visual containing Average of AveragePrice returns the same 4.56. Now let's consider SAP HANA, when the connection is treated as a relational source. Power BI can work with both Analytic Views and Calculation Views in SAP HANA, both of which can contain measures. Yet today the approach for SAP HANA follows the same principles as described previously in this section: the query defined in Get Data or Query Editor will determine the data available, and then any subsequent aggregation in a visual is over that data, and the same applies for both Import and DirectQuery. However, given the nature of SAP HANA, the query defined in the initial Get Data dialog or Query Editor is always an aggregate query, and generally will include measures where the actual aggregation that will be used is defined by the SAP HANA view. The equivalent of the SQL Server example above is that there is a SAP HANA view containing ID, ProductID, DepotID, and measures including AveragePrice, defined in the view as Average of Price. If in the Get Data experience, the selections made were for ProductID and the AveragePrice measure, then that is defining a query over the view, requesting that aggregate data (in the earlier example, for simplicity pseudo-SQL is used that doesn’t match the exact syntax of SAP HANA SQL). Then any further aggregations defined in a visual are further aggregating the results of such a query. Again, as described above for SQL Server, this applies both for the Import and DirectQuery case. In the DirectQuery case, the query from Get Data or Query Editor will be used in a subselect within a single query sent to SAP HANA, and thus it is not actually the case that all the data would be read in, prior to aggregating further. Attention must be paid to any further aggregation performed in visuals, whenever the measure in SAP HANA is non-additive (for example, not a simple Sum, Min, or Max). In Get Data or Query Editor, only the required columns should be included to retrieve the necessary data, reflecting the fact that the result will be a query, that must be a reasonable query that can be sent to SAP HANA. For example, if dozens of columns were selected, with the thought that they might be needed on subsequent visuals, then even for DirectQuery a simple visual will mean the aggregate query used in the subselect will contain those dozens of columns, which will generally perform poorly. Let's look at an example. In the following example, selecting five columns (CalendarQuarter, Color, LastName, ProductLine, SalesOrderNumber) in the Get Data dialog, along with the measure OrderQuantity, will mean that later creating a simple visual containing the Min OrderQuantity will result in the following SQL query to SAP HANA. The shaded is the subselect, containing the query from Get Data / Query Editor. If this subselect gives a high cardinality result, then the resulting SAP HANA performance will likely be poor. Because of this behavior, we recommend the items selected in Get Data or Query Editor be limited to those items that are needed, while still resulting in a reasonable query for SAP HANA. For both approaches to connecting to SAP HANA, recommendations for using DirectQuery also apply to SAP HANA, particularly those related to ensuring good performance. 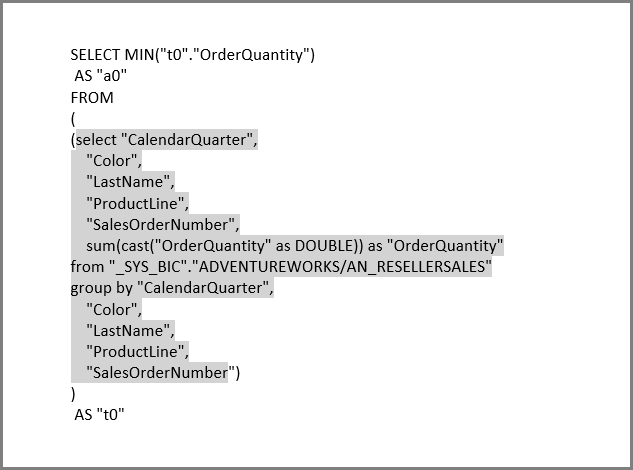 These recommendations are described in detail in the article using DirectQuery in Power BI. The following list describes all SAP HANA features that are not fully supported, or features that behave differently when using Power BI. Parent Child Hierarchies - Parent child hierarchies will not be visible in Power BI. This is because Power BI accesses SAP HANA using the SQL interface, and parent child hierarchies cannot be fully accessed via SQL. Other hierarchy metadata - The basic structure of hierarchies is displayed in Power BI, however some hierarchy metadata (such as controlling the behavior of ragged hierarchies) will have no effect. Again, this is due to the limitations imposed by the SQL interface. Connection using SSL - You can connect using Import and multi-dimensional with SSL, buy cannot connect to SAP HANA instances configured to use SSL for the relational connector. Support for Attribute views -	Power BI can connect to Analytic and Calculation views, but cannot connect directly to Attribute views. Support for Catalog objects - Power BI cannot connect to Catalog objects. Change to Variables after publish - You cannot change the values for any SAP HANA variables directly in the Power BI service, after the report is published. 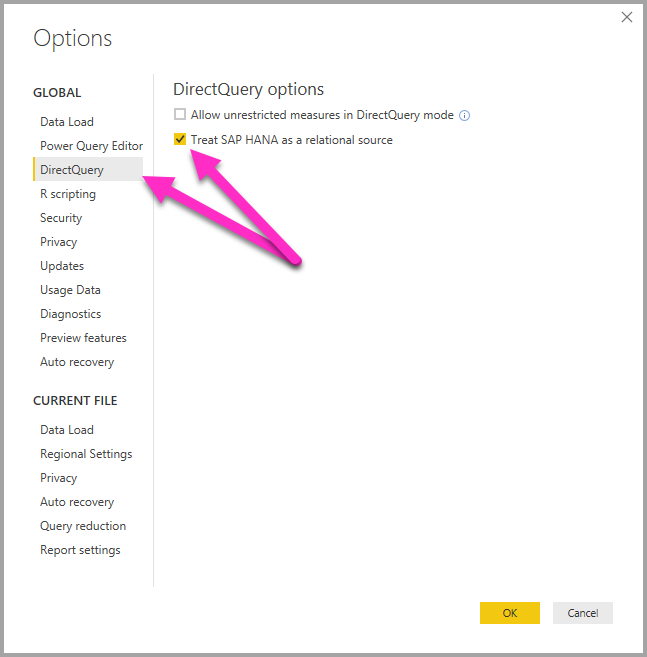 The following list describes all known issues when connecting to SAP HANA (DirectQuery) using Power BI. SAP HANA issue when query for Counters, and other measures - Incorrect data is returned from SAP HANA if connecting to an Analytical View, and a Counter measure and some other ratio measure, are included in the same visual. This is covered by SAP Note 2128928 (Unexpected results when query a Calculated Column and a Counter). The ratio measure will be incorrect in this case. Multiple Power BI columns from single SAP HANA column - For some calculation views, where a SAP HANA column is used in more than one hierarchy, SAP HANA exposes this as two separate attributes. This results in two columns being created in Power BI. Those columns are hidden by default, however, and all queries involving the hierarchies, or the columns directly, behave correctly.